The story behind this photo is a bit interesting. 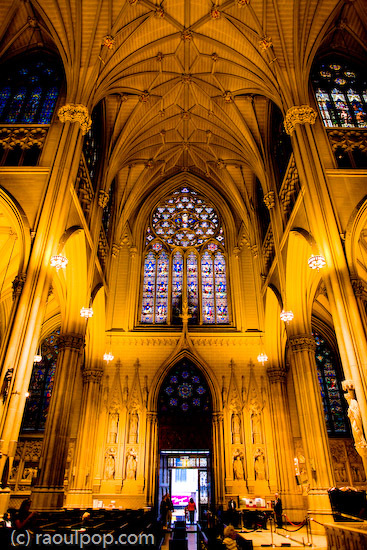 Ligia and I were visiting St. Patrick’s Cathedral in New York when I took this photo. I didn’t have a tripod with me, so this was taken handheld with my 24mm lens. This is why I love fast lenses and cameras that have very little noise. Three weeks later, close friends of ours were visiting, and I had a gift for them. I asked them to go through the photos I took in Manhattan and pick out one they liked best. I’d then postprocess and print it on the spot. They picked this one and I did my part. A day or so later, I uploaded it to Flickr, and it made it to Explore within 12 hours. Why the title? Because more people seemed to walk out than walk in. I can see why someone would pick this. It’s a great perspective and exposure. I’m jealous of your fast glass.